This year’s winner of the Columbus Fire Department’s Fire Prevention Week poster concert was Alyson Hendershot, a fifth grader at Clifty Creek Elementary School. The contest was judged by firefighters and staff from White River Broadcasting. Alyson will receive five tickets to Holiday World and Splashin’ Safari. 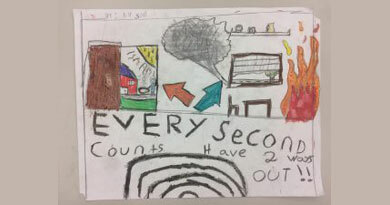 The poster contest was on the theme of “Every Second Counts, Know 2 Ways Out” and Alyson created a poster showing an interior perspective of a home illustrating available exits. The fire department received 97 submissions from local children, ages 12 and younger. Fire Prevention Week is Oct. 8-14. The Columbus Fire Department hopes that you will take some time to focus on fire prevention and preparedness.